Looking for an integration to your favorite tool. Use our connection with zapier.com to connect Riddle to just about anything. We are big fans of integrating Riddle into as many services as possible. If you are using quizzes, personality tests, polls and surveys to also collect leads, you will most likely want to continue using your most favorite email service to follow up on these leads. If you are currently using AWeber or MailChimp you will not need to go the zapier.com route. All of our plans offer a native integration with these two tools. The native integration will be perfect for all normal use cases. For some special cases and more automation though, connecting to AWeber and MailChimp through Zapier offers some extra benefits. Contact us if you have specific questions about this. 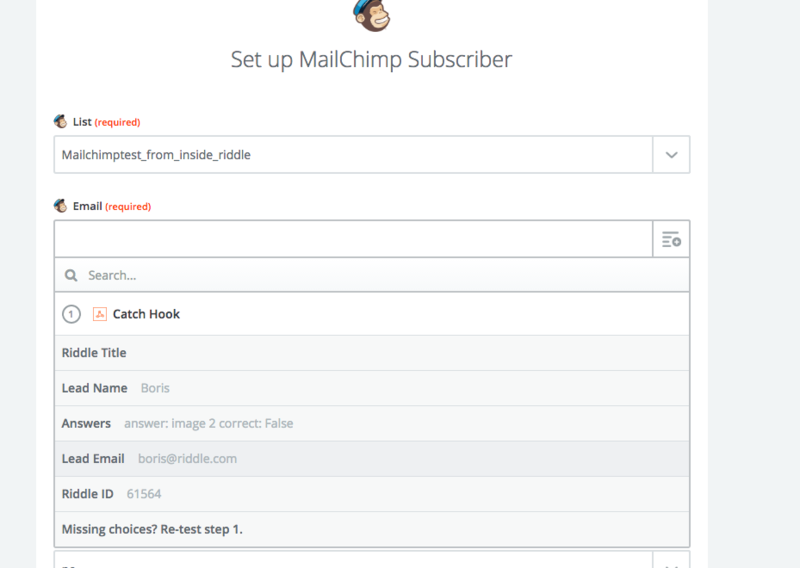 Riddle integrates natively with AWeber and MailChimp, which means you can show an AWeber or a MailChimp form before you provide the answer to your quiz and all leads will automatically show up in your respective mailing lists. But as there are literally hundreds of tools out there and everyone has their own favorite, we are supporting zapier.com, which in turn connects to pretty much any other tool – from Salesforce.com to Lead Pages. We are using our webhook to send all Riddle data on to Zapier. In Zapier you can grab that webhook, process the data and send it on to a tool of your choice. You could for example run a quiz to find out where people like to vacation (mountains, city or at the sea) and based on their results send the lead into a different sales funnel in Sales Force or tag the lead for automated follow up in Lead Pages. You can also use zapier.com to create automated follow up emails that send out a more detailed quiz result to the quiz taker. This is one cool way to get higher lead conversions. When your reader is done answering questions, show a lead form and ask the user to leave a name and an email to receive a detailed quiz result including some additional personalized advise based on the quiz score. Then show a brief result page built in Riddle on which you ask the user to check his inbox. In Zapier, build an automated follow up email flow that sends out a preconfigured follow up email, using info from the quiz and other calls to action tailored to how the user scored in your quiz. Check out the Riddle Blog posts below to learn more about this and sign up for your 14 day free trial (no credit card needed) of Riddle.com to put this into action on your website today. Connecting MailChimp to Riddle using Zapier - a great template for all other zapier.com connections. Automate E-Mail Marketing using Zapier. Send customized results to your users if they fill out the lead gen form. Deep dive into some advanced Zapier features. Zapier too expensive for your use case (depending on how much of the zapier.com features you are using, the free service will not work for you). Check out this post on how you can process Riddle data on your own server using our webhoo.